“-Re” House together with “-Re” Adapt are two series part of a project in which I review, refine and redesign residential projects available on the Dutch housing market. “-Re” House touches projects that have been completed after the year 2000 and could have been done more efficiently to begin with, while “-Re” Adapt looks at how to better adapt older residential architecture that was designed in a different cultural and historical context. I personally look for, and get much more exited about apartments with funky shapes, like “-Re” House no. 28 or “-Re” Adapt no. 6. They represent a challenge, a game for myself. That being said, the challenges most people face look like the one below: basic, standard, cheap and prefabricated. Not that there would be anything wrong with using prefabricated elements, but even those have standards. • The things that drew my attention were the entry corridor, the circulation between kitchen and living room and the larger hallway space between the two bedrooms on the left. • Architecture and implicitly interior design are directly influenced by the culture they are designed for, which makes perfect sense as it is a highly personalized endeavor. Most of my university colleagues are adamant (to put it mildly) against an open kitchen. They design for a culture where certain traditional dishes do come with higher requirements in terms of ventilation. However, in my opinion, the choice between an open and a closed kitchen comes down to priorities: cultural, social and personal. But that is a discussion for a future article. • I didn’t like the entry way/kitchen combo. Which obviously made for the first reorganization in this apartment. I also don’t like the window in the kitchen wall (left of the stove) used to move food from one space to the other. It is a puny reminder of a time when cooking was a separate feature from the dinner time. I opened the space and brought the stove closer to the window, and thus further from the dining area. The fridge is an element used during the actual cooking time but also through out the rest of the day (drinks, snacks, etc), making much more sense to have it towards the dining area. This has the added bonus of minimal disruptions to the cooking party while allowing for an easy connection. • As I previously mentioned, walking in front of the TV area, in order to reach the terrace/balcony is not the best option. However, sometimes due to the shape of the room, it becomes a bargaining chip that allows other more important elements to take shape. • If you’ve been here a while, you know my stance on the design for the children’s bedrooms. Even in small spaces, design allows for a clear separation between work/study/play spaces and sleep. 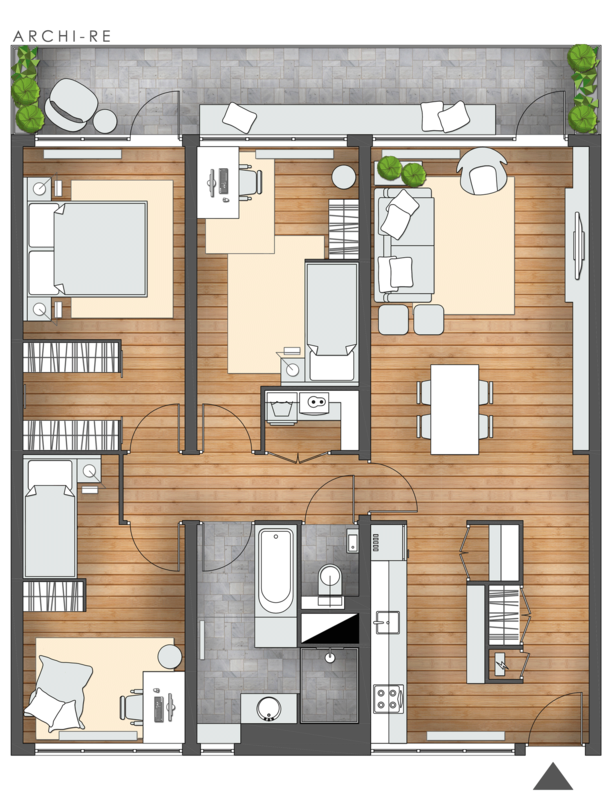 • I am not sure what the larger hallway space (left between the two bedrooms) was meant to be. I initially assumed that to be an open work space, but upon inspecting the interior pictures I found a rather wasted space. In my book, that would make an excellent location for the laundry room. It is in the direct vicinity of the three bedrooms yet far enough from the living room. That being said, I have to admit that I don’t have enough information in regard to the technical elements of this apartment, and by that I mean the vertical pipe lines. The one vertical pipe line that I can easily identify is the one behind the toilet. 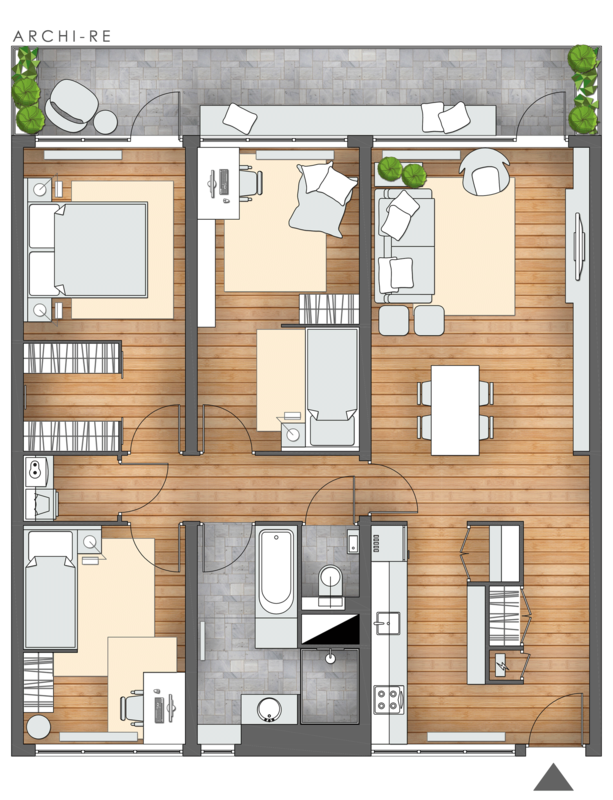 If the apartment on the left side has a similar layout, there is no pipe line close by to connect to. And that could pose some difficulties. So an easier option (in terms of distance) is the one below, where the laundry room is located across from the toilet/bathroom.